Founded in 1999, FXCM was the first forex broker to list on the New York Stock Exchange (NYSE: FXCM) and is one of the biggest providers of online forex and CFD trading, spread betting and related services worldwide, servicing institutional and retail clients alike. The company has units registered and regulated with the relevant authorities in the US, the UK, Australia, and France, and offices around the world (New York, London, Berlin, Paris, Athens, Milano, Sydney, Tokyo, and Hong Kong). The brokerage had another two units – FXCM Japan and FXCM Asia (Hong Kong) – but they were sold to Japanese broker Rakuten Securities in August last year. 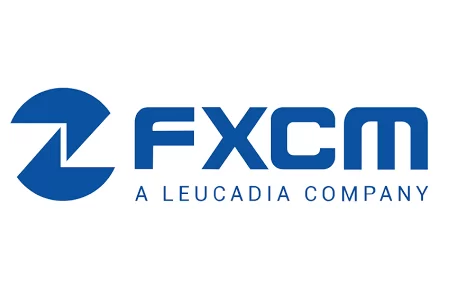 After the Swiss Franc spike in January 2015, FXCM suffered great losses which necessitated the sale of FXCM Japan & Asia, as well as the $300 million loan from Leucadia, which is still outstanding. Despite the above said, there is no doubt in the financial stability of company, and FXCM is still a top US broker in terms of both retail trading volume & client deposits. The brokerage has received numerous awards from the forex trading and investment community over the years, including Best Retail Broker North America from Global Financial Market Review (2013), Highest Overall Client Satisfaction and Education Materials from Investment Trends (2014), Best Sell-Side Analysis Contributor: DailyFX from FXstreet.com (2013), Best Proprietary FX Platform from Forex Magnates (2013) and more. FXCM takes regulation, financial transparency and investor protection very seriously— as a global publicly traded company, regulated in several jurisdictions, it meets strict requirements and financial standards, including capital adequacy requirements. The companies within the FXCM group are registered with and regulated by some of the most respected regulatory bodies in the world: NFA in the US, FCA in UK and ASIC in Australia. Minimum regulatory capital requirements for continuing operations within these jurisdictions is $20 million in the USA, €730 000 in the UK, and $1 million in Australia. FXCM however, has regulatory capital of $167 million, so there is a large surplus. Headquartered in New York, FXCM Holdings, LLC is a registered Futures Commission Merchant (FCM) and Retail Foreign Exchange Dealer (RFED) with the Commodity Futures Trading Commission (CFTC) and is a member of the National Futures Association (NFA). The U.S. regulatory framework is regarded as one of the best in terms of investor protection. However, this also involves some serious restrictions, such as leverage cap of 1:50, and the first-in-first-out (FIFO) rule, which practically prohibited hedging. FXCM’s UK entity, FOREX Capital Markets Ltd., is authorized and regulated by the Financial Conduct Authority (FCA) and therefore is under the umbrella of the Financial Services Compensation Scheme (FSCS). Clients of FCA regulated entities are entitled to receive compensation up to £50,000 in total. At the heart of FXCM’s business is their direct market access, achieved through No Dealing Desk (NDD) offering. This execution model provides traders with transparent buy and sell prices streamed from over a dozen global institutions 24 hours a day, five days a week. 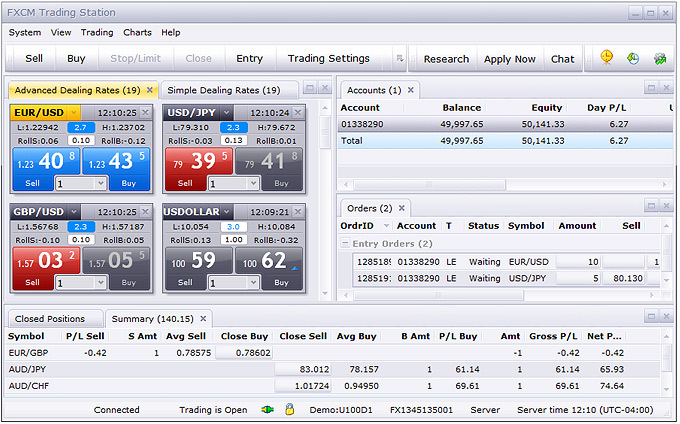 FXCM is able to provide such competitive spreads and even price improvement (e.g. positive slippage) due to its liquidity providers, including global banks, financial institutions, prime brokers, and other market makers. FXCM offers three account types: Mini, Standard, and Active Trader. The Mini account is commission-free and provides Dealing Desk execution. Arbitrage strategies are prohibited on Mini accounts and API connections are also not available. Standard & Active Trader accounts offer significantly tighter spreads and NDD execution, but involve commission fees of $4/£3 per standard lot (per side). Active Trader account holders may benefit from commission discounts, provided that they satisfy certain trading volume requirements. This broker offers an array of trading platforms to its clients, including the most popular MetaTrader 4, its award-winning proprietary Trading Station, and NinjaTrader. Copy trading is available through ZuluTrade and Mirror Trader. Trading Station is FXCM’s proprietary award-winning platform with sleek design and intuitive functionalities. It is available as Desktop, Web, and Mobile versions. Custom Indicators: over 600 custom indicators available. What is more, with this platform you can use automated strategies that take the human element out of trading. You may easily determine key areas where your trading strategies can be improved, and gain confidence in your strategies prior to real forex market use by using Trading Station’s strategy optimizer which backtests forex trading strategies. There are also some exclusive tools with Trading Station, like the unique order type, Good Till Date, which lets you execute at specific times; streaming news from DailyFX; and the broker’s exclusive Real Volume indicators, which opens FXCM’s trading book of 200,000 traders around the world. Offered by most brokers on the market and preferred by most traders, MetaTrader 4 is of course within the set of platforms offered by FXCM. The platform comes equipped with an outstanding charting package, numerous built-in technical indicators, Fibonacci retracements, trend lines, support and resistance levels, and so on – pretty much everything a trader needs. Those who are handy with code may create their own automated strategies (EAs) and custom indicators in the MQL programming language. FXCM added NinjaTrader to its offerings back in 2012. This platform offers all of the functionalities that you can make use of if you trade on Metatrader 4 or the desktop version of Trading Station, and even more. You can benefit from NDD execution, trading from charts, building your own automated strategies, superior back-testing options, custom indicators and alerts. NinjaTrader’ s interface is user friendly and will especially suit those traders who dislike overcrowded trading environments. Mirror Trader is yet another copy trading option. allows traders to follow the strategies and signals of other traders. With Mirror Trader traders can evaluate and build a portfolio of back-tested strategies, or can follow individual signals that support your own trading analysis. One of the biggest FX bokerages worldwide, FXCM is an excellent choice: a reliable and well regulated broker, offering great conditions for trading in currency ppairs and CFDs on a wide range of trading platforms.